A Metallogorgia sp. octocoral with a commensal serpent star (Ophiocreas sp.). It is suspected that these two species require each others’ presence to survive! Image courtesy of the NOAA Office of Ocean Exploration and Research, Gulf of Mexico 2017. Download larger version (jpg, 938 KB). A stalked hyocrinid sea lily with Amathillopsis sp. amphipods living on the stalk. These amphipods are usually found in mating pairs and use the stalk’s height off the seafloor to catch particles passing in the water column for food. Image courtesy of the NOAA Office of Ocean Exploration and Research, Gulf of Mexico 2017. Download larger version (jpg, 702 KB). One of the spectacular sessile communities spotted during the dive. These were mostly comprised of octocorals, black corals, and sponges. Image courtesy of the NOAA Office of Ocean Exploration and Research, Gulf of Mexico 2017. Download larger version (jpg, 811 KB). To the backdrop of video highlights from exploration of a portion of the West Florida Escarpment known as "Smooth Escarpment Ridge," co-science lead Diva Amon considers how this expedition sets the stage for follow-on research of our vast and unknown ocean. Video courtesy of the NOAA Office of Ocean Exploration and Research, Gulf of Mexico 2017. Download larger version (mp4, 22.3 MB). Today’s dive was the second of an exploratory pair that compared the geology and associated communities between 1,800-2,300 meters (5,905 - 7,545 feet) depth at the northern end of the West Florida Escarpment. Unlike the first dive, which took place yesterday, this dive explored an area where the escarpment has very reduced promontories, which results in near-vertical slopes. The dive started at a depth of 2,091 meters (6,860 feet) on a sedimented slope with a number of gullies, concretions, and outcrops that provided habitat for numerous fish species, a variety of cnidarian species, and several sponge species. Continuing upslope, the terrain changed to a near-vertical ferromanganese-encrusted cliff wall, which coincided with an increase in abundance and diversity of organisms, including several coral species. In this area, we observed a ledge where the crust acted as a trap for debris, including large ferromanganese-encrusted coral skeletons that had fallen from upslope. 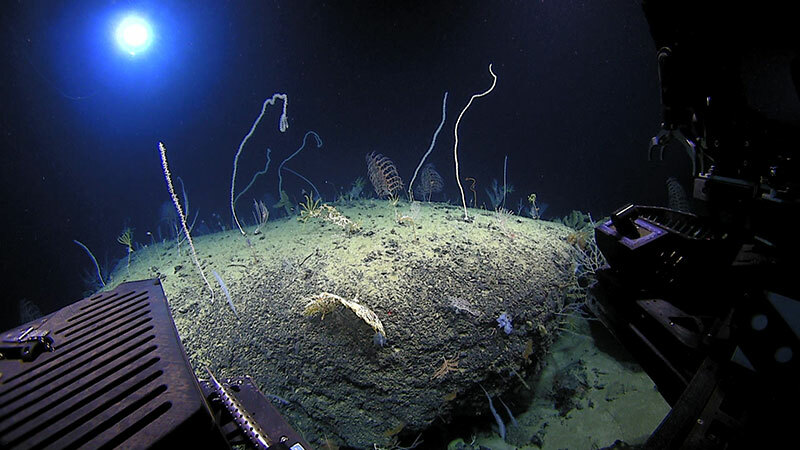 As remotely operated vehicle Deep Discoverer ascended the cliff, we observed a number of exposed plateaus with spectacular sessile communities comprised of corals, sponges, and a surprising abundance of crinoids belonging to six or seven different families. Many of the stalked crinoids had commensals, which included featherstars and Amathillopsis sp. amphipods on the stalks. 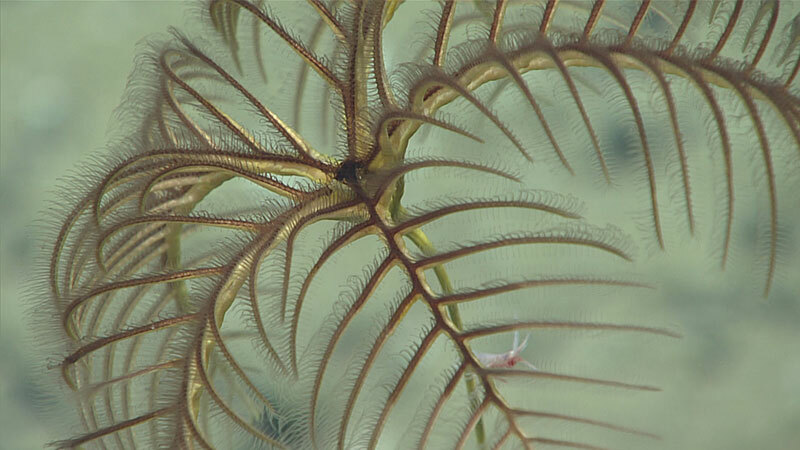 Other notable observations during the dive included an ‘adolescent’ octocoral (Metallogorgia sp. 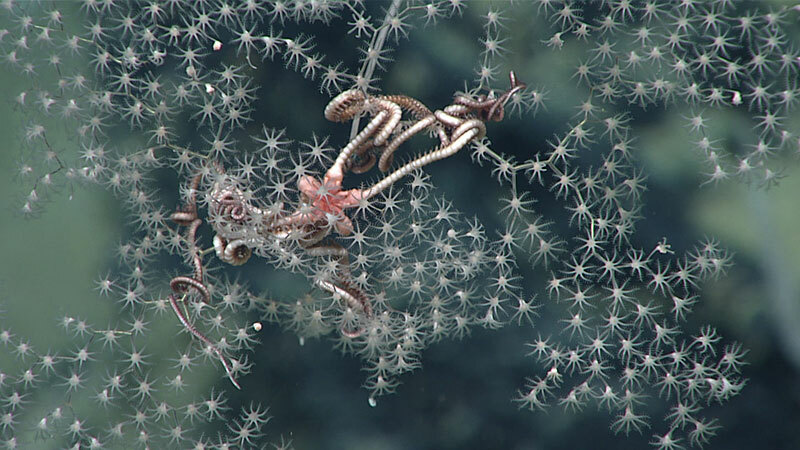 ), a dandelion siphonophore, and a number of sea stars consuming octocorals.